To Cite: Badri A, Shirafkan S, Razavi M, Atarbashi Moghadam S. A Novel Treatment of Aggressive Psammomatoid Juvenile Ossifying Fibroma: A Case Report, Jentashapir J Health Res. 2014 ; 5(4):e21888. doi: 10.17795/jjhr-21888. 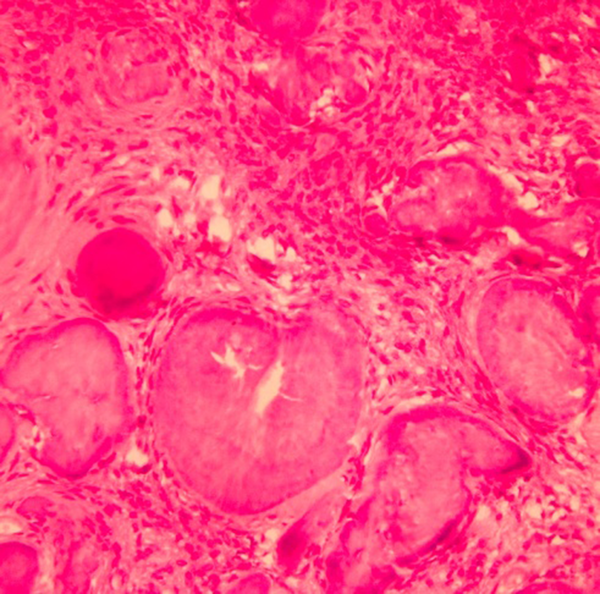 Introduction: Juvenile ossifying fibroma is a benign, bone-forming neoplasm with aggressive local growth that is distinguished from other fibro-osseous lesions primarily by its age of onset, clinical presentation and aggressive behavior. Although a benign entity, juvenile ossifying fibroma is known to be locally aggressive and has a high tendency to recur. Two distinctive microscopic patterns have been described: a trabecular variant and a psammomatoid variant. This latter variant is predominantly a craniofacial lesion and occurs rarely in the jaws. Treatment plans include a range of enucleation to total resection. Case Presentation: Reported here is a case of a huge psammomatoid juvenile ossifying fibroma of the maxilla in a 19-year-old man. Right maxillectomy was done while brain exposure in sphenoid and ethmoidal region was covered with fat and bone graft. After 1 year follow up, an endosseous dental implant was inserted in right lateral pterygoid plate. Conclusions: Six months later an obturator was made over that osseointegrated implant to reconstruct the anatomic defect, achieving functional rehabilitation and satisfactory facial appearance. Ossifying fibroma (OF) is a benign neoplasm of bone that has the potential for excessive growth, bone destruction, and recurrence (1). It is usually asymptomatic, achieving a large size, exhibiting aggressive behavior, and being termed usually in the literature as ‘juvenile ossifying fibroma,’ ‘aggressive ossifying fibroma,’ or ‘active ossifying fibroma’ (2). The term JOF is used in the literature to describe two distinct histopathological variants of ossifying fibroma namely psammomatoid juvenile ossifying fibroma (PsJOF) and trabecular form (TrJOF) (3). Johnson et al. reviewed 3000 fibro-osseous lesions and found that a majority of tumors were located in facial bones, among which approximately 90% originated from paranasal sinuses. Single or multiple sinuses may be involved. When jaws are involved, the chances of affecting maxilla is more than the mandible, as seen in the present case (4). Pimenta et al. reported the association of a new tumor suppressor gene (HRPT2) mutation with ossifying fibroma and suggested that these lesions could arise as a result of haploinsufficiency of the particular gene (5). Here we report a rare case of juvenile ossifying fibroma of maxilla in a 19-year-old male, who was treated with a minimally invasive approach. A 19-year-old male presented with a swelling in right maxilla, cephalic displacement of the right globe and chief complaint of nose blockage (Figure 1). Past history revealed that the lesion was present for the past one year. On extraoral examination and palpation, the swelling was bony hard and nontender extending from infraorbital rim to the gingivobuccal sulcus. On intraoral examination, a diffuse proliferative mass was present in the right maxilla extending anteriorly from right maxillary lateral incisor and posteriorly up to the maxillary tuberosity, laterally obliterating the mucobuccal sulcus and medially up to the midline of the palate, with intact mucosa, did not bleed on touch, without loss and loosening of teeth. 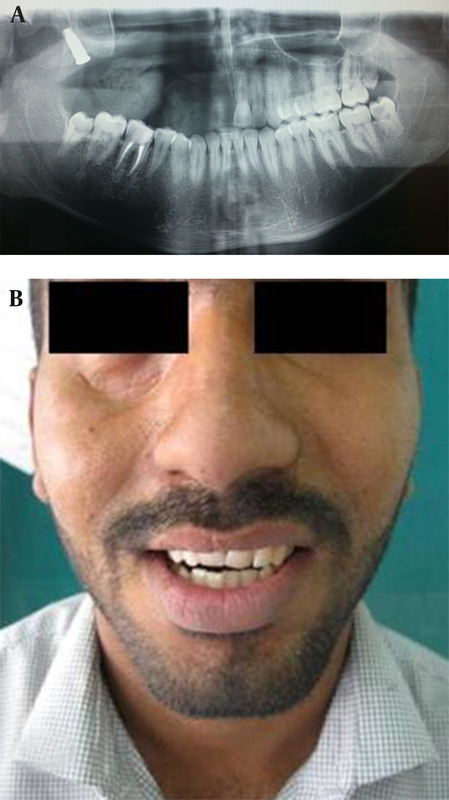 Radiographic examination showed a radiopaque lesion with areas of radiolucency extending from right lateral incisor anteriorly up to the maxillary tuberosity region posteriorly, which showed entire maxillary sinus involvement. 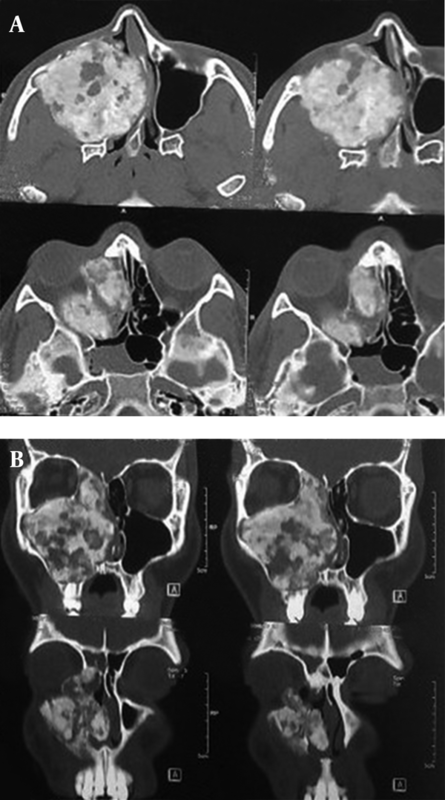 Destruction of right infraorbital rim, right nasal turbinates, lateral and medial maxillary sinus walls, involvement of ethmoid and sphenoid sinuses, deformation of hard and soft palate, and nasal septum deviation were the consequences of the tumor extension (Figure 2). Figure 1. 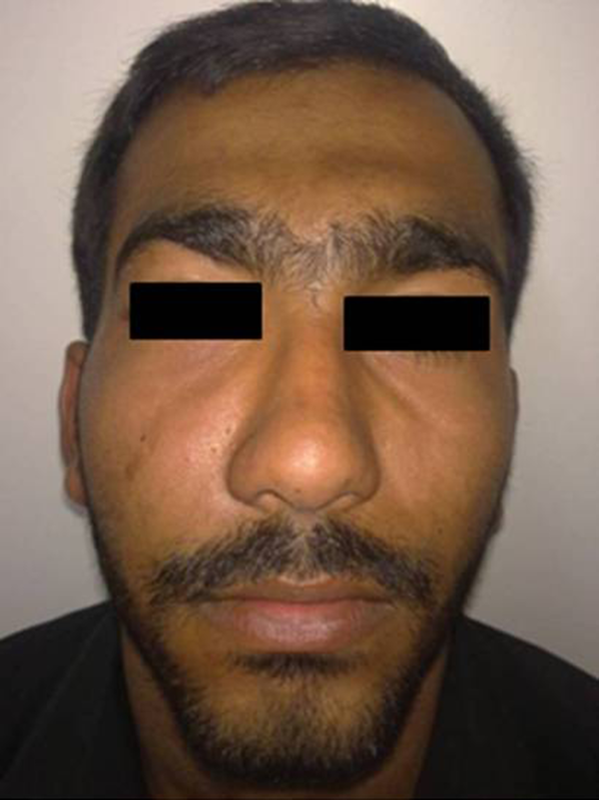 Clinical Appearance Shows Swelling on Right Maxilla and Cephalic Displacement of Right Eye. Note the destruction of right inferior orbital floor and nasal turbinates. Septal deviation and nasal obstruction are obvious. It also involved the ethmoid and sphenoid sinuses ipsilaterally. A provisional diagnosis of ossifying fibroma was made (Figure 3). Right maxillectomy was done, and because of tumor extension, the brain was exposed in sphenoid and ethmoid region. It was covered with fat and bone graft (Figure 4). Orbital floor periosteum and orbital contents were preserved as the globe support. The cavity was lined by buccal fat pad and local flaps. On macroscopic examination, the resected segment measured about 7 × 5 × 4 cm (Figure 5). After 12 months follow up, an endosseous dental implant was inserted in right lateral pterygoid plate in out-patient setting, and 6 months later, an obturator was placed over the osseointegrated implant to reconstruct the anatomic defect, achieving functional rehabilitation and satisfactory facial appearance (Figure 6 A and B). Juvenile ossifying fibroma (JOF) is an uncommon lesion that has been distinguished from the larger group of ossifying fibromas on the basis of the age of the patients, most common site of involvement, and clinical behavior (6). The incidence of JOF is still unknown because of its relatively few cases reported (7). Johnson et al. have reported JOFs occurring at any age between 3 months and 72 years (4). These lesions are unique because of their aggressive behavior mimicking malignancy (8), so needs to be distinguished from malignant bone tumors because there is a similarity of clinical manifestations, but JOF can be easily excluded from malignant bone tumors on the routine histological examination (9). PsJOF is a variant of JOF that has a predilection for the sinonasal tract and the orbit particularly centered on the periorbital, frontal, and ethmoidal bones (10). Approximately, 75% of PsJOFs develop in the orbit, paranasal sinuses, and calvaria, whereas only about 25% of all cases involve the maxilla or mandible (8). The first clinical manifestation is a swelling of the maxilla. When the orbital rims and paranasal sinuses are involved, the patients may develop exophthalmos, bulbar displacement and nasal obstruction. The radiologic features are variable and depend on the tumor’s location and the amount of calcified tissue produced by the tumor, and the lesion will show varying degrees of radiolucency (2). But it usually shows a round, well-defined, sometimes corticated osteolytic lesion with a cystic appearance. Sclerotic changes are evident in the lesion which may show a ground-glass appearance. In computed tomographic scans set on bone window, the lesions appear less dense than normal bone. The lesions may range in size from 2 to 8 cm in diameter as also seen in our case. PsJOF may appear multiloculated on CT scans. Areas of low CT density may be noted due to cystic changes (11). The pathogenesis of PsJOF jaw lesions are associated with the maldevelopment of basal generative mechanism that is essential for root formation. The developing tooth can either be displaced, missing or remain unerupted. The pathognomonic feature of this fibro-osseous lesion is the presence of eosinophilic spherical structures dispersed in a fibrous stroma consisting of uniform, stellate, and spindle shaped cells that are arranged as strands and whorls (5). Golg was the first to term these unique spherical structures as Psammoma-Like bodies. These particles vary in appearance, but usually have a central basophilic area and a peripheral eosinophilic fringe (12). Ultrastructurally, Psammoma-like bodies in PsJOF were found to possess a dark rim of crystals from which small spicules and needle-like crystalloids project toward the periphery. Cystic degeneration and aneurysmal bone cyst formation have been reported in some cases (5). The clinical management and prognosis of JOF are somewhat uncertain (2). The treatment of choice is surgical excision. Small and well demarcated lesions can be excised by enucleation and curettage, whereas larger lesions, that show a more aggressive pattern, especially in the maxilla, require radical surgery within healthy margins (13). Early detection and complete surgical excision of these lesions as well as long-term follow up bear importance in clinical management due to their aggressive nature and high recurrence rate (14). 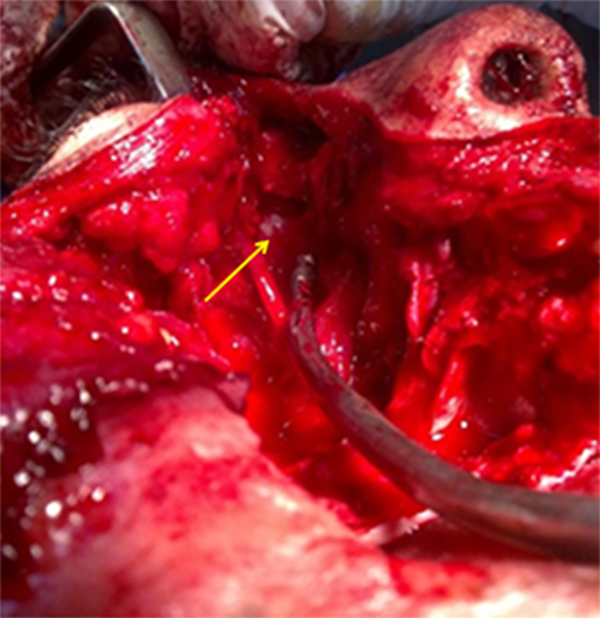 Although many authors favor conservative surgery rather than radical en bloc resection, immediate recurrence characterized by a high aggressive growth rate and the absence of a distinct separation between tumor and the adjacent bone requires extensive surgery, with wide demolition of the involved bone. In the present case, a right maxillectomy was performed, because the lesion had grown to a massive size and caused cosmetic and functional problems. For reconstruction of the surgical defect, a dental implant was inserted in accessible bones-lateral pterygoid plate- to help fabricating an obturator, either for functional or cosmetic reasons instead of local or distant flaps. Patigaroo S A. preserved periosteum and orbital contents after total maxillectomy. Cavity was lined by split thickness skin graft, and a transient obturator with an artificial denture was placed in the cavity with the support of the remaining teeth (3). Donor site scar and risk of infection are some of the skin graft disadvantages. In this case, we used buccal fat pad and local flaps. We inserted a dental implant in the area, to fabricate a permanent obturator with the means of better function and stability. Triantafillidou et al. closed the defect with a free vascularized bone graft which failed 6 months later. After one year, the patient returned and the therapeutic treatment was completed by an iliac bone graft and placing two implants (13). The patient was undergone two separate operations. Time consuming surgery, donor site defect, graft morbidity and probability of infection are some of the consequences of the mentioned research. In this research, distant flaps were not used. Sun G et al. bridged the bony defect using a folded titanium mesh to reconstruct the facial contour and to support the orbital contents. Rotation of a mucoperiosteal palatal flap was used to seal the oral cavity from the nasal space (2). Titanium mesh has the risk of foreign body infection. In the present study, orbital floor periosteum was saved as orbital support. In total, the use of local flaps integrated with dental implant, which we used in this case, has limited complications. Early detection and complete surgical excision of these lesions, accompanied with a long-term follow up, bear importance in clinical management because of their aggressive nature and high recurrence rate. Funding/Support: We thank the Imam Khomeini hospital and Jundishapur dental faculty for research and technology.